Look at MALTAway Skyline webcam to see live HD video streaming, from around the world, to learn, observe and experience the same emotions you feel when you are physically there. 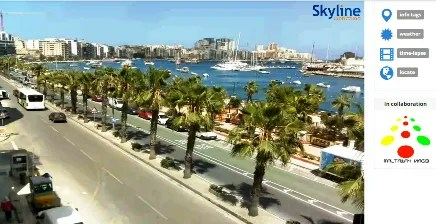 The MALTAway Skyline Webcam’s portfolio, is the ideal way to promote a territory, a particular place, a business, a hotel, a store, to live stream a sport, musical or culural event, a festival or a convention, to monitor traffic or for safety purposes and finally to involve a client live before, during and after their experience with your business… there are endless possibilities !! The webcam MALTAway Skyline offers a live high definition cam packed with advanced technology. It is of outstanding value, easy to install and can transmit from networks of only 64 Kbps upload, with a normal ADSL connection. The services offered by Skyline are varied: from the transmission of live images 24/7, the streaming of a special event, advertising through banners, to cloud streaming … but everything with a very competitive edge for technology and prices compared to what is available today in US and Asia. The site Skyline Webcams has an ever growing 8 million viewers per month. This is the future of promotional advertising / This is the next generation promotional advertising product!!! Contact Maltaway to explore with us the wonderful world of webcams , to have a taste of the ultimate results, to experience the cutting edge technologies of Skyline to understand your needs, and to get a quote and receive step-by-step guidance on installation.